Oxford University Press, USA, 9780195104707, 480pp. This pioneering collection of previously unpublished articles on lesbian, gay, bisexual, and transgender language combines queer theory and feminist theory with the latest thinking on language and gender. The book expands the field well beyond the study of "gay slang" to consider gay dialects (such as Polari in England), early modern discourse on gay practices, and late twentieth-century descriptions of homosexuality. These essays examine the conversational patterns of queer speakers in a wide variety of settings, from women's friendship groups to university rap groups and electronic mail postings. Taking a global--rather than regional--approach, the contributors herein study the language usage of sexually liminal communities in a variety of linguistic and cultural contexts, such as lesbian speakers of American Sign Language, Japanese gay male couples, Hindi-speaking hijras (eunuchs) in North India, Hausa-speaking 'yan daudu (feminine men) in Nigeria, and French and Yiddish gay groups. 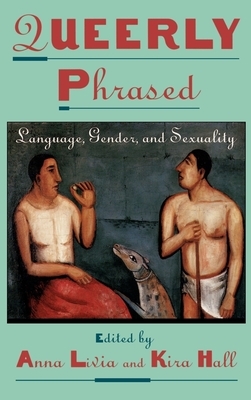 The most accessible and diverse collection of its kind, Queerly Phrased: Language, Gender, and Sexuality sets a new standard in the study of language's impact on the construction of sexuality.